The BlueRAY Prestained Protein Ladder is a three-color protein standard with 10 pre-stained proteins covering a wide range molecular weights for 10 to 180 kDa. 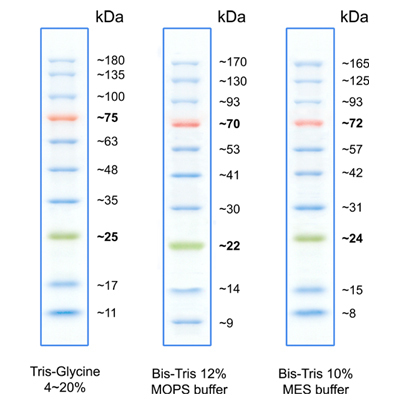 Proteins are covalently coupled with a blue chromophore except for two reference bands (one green and one red band at 25 kDa and 75 kDa respectively) when separated on SDS-PAGE (Trisglycine buffer). The BlueRAY Prestained Protein Ladder is designed for monitoring protein separated during SDS polyacrylamide gel electrophoresis, verification of Western transfer efficiency on membranes (PVDF, nylon or nitrocellulose) and for approximate sizing of proteins. The ladder is supplied in gel loading buffer and is ready to use. Do not heat, dilute, add reducing agent before loading.